Draft decisions within the Miami Dolphins seem to be firmly in control of general manager Chris Grier and Executive Vice President of Football Operations Mike Tannenbaum as the 2018 NFL Draft will mark Grier’s third as the Dolphins’ GM. Grier’s selections in the most recent drafts have hailed from bigger, more well-known programs as only one of their most recent 15 draft selections have come from a non-Power-5 FBS team (Brandon Doughty, Western Kentucky). 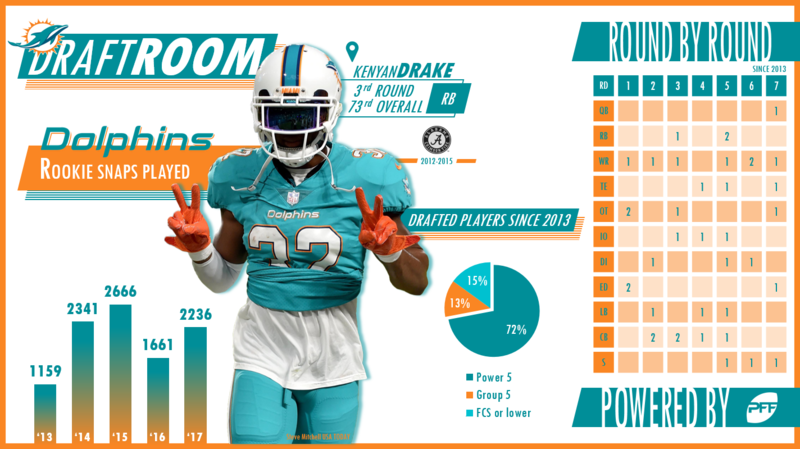 There are several items of need for the Dolphins heading into the 2018 season, even after the addition of Josh Sitton on the offensive line, Danny Amendola and Albert Wilson at wide receiver and Robert Quinn along the defensive line. Miami lost Pro Bowl DT Ndamukong Suh during free agency as well as center Mike Pouncey to Los Angeles area teams, and Miami brass may look to target their need there early in the draft. They have had no issue in the past selected multiple players in an area of need in specific draft classes, targeting five offensive skill players in 2016 and four front-seven defensive players in 2017. Many questions remain entering 2018 for the Dolphins, many centered around the return of quarterback Ryan Tannehill and whether or not this is the last season he’ll spend with the franchise. If that is a question on the minds of the Dolphins’ front office remains to be seen, but we’ll know soon enough come draft time if they’ve deemed it important enough to at least draft a possible backup to Tannehill. The team also lost receiving threat Jarvis Landry, replacing him with the aforementioned Amendola and Wilson. Using our Wins Above Replacement (WAR – roughly the number of wins a team gets from replacing an off-the-street player with the player of interest) metric as a model, Landry was the lone player drafted by Miami over the past five years worth more than 1.0 WAR per year, leaving a significant hole on the roster upon his departure.